(NORTH BAY, ONT.) 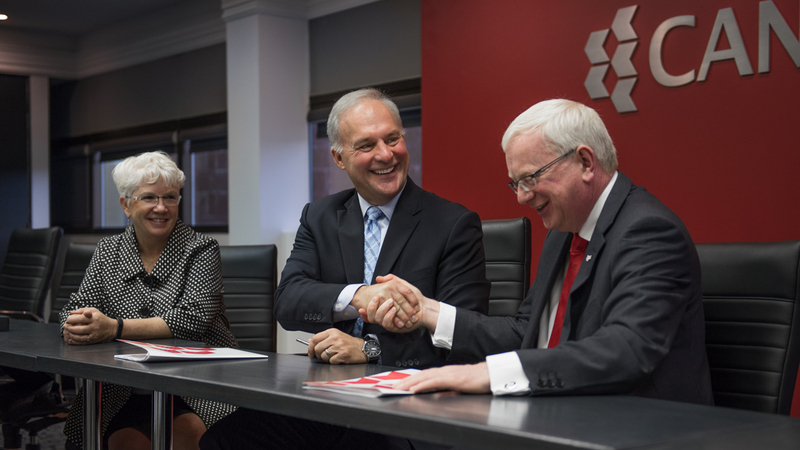 – This morning, five new articulation agreements were signed between Canadore College and Ireland’s Limerick Institute of Technology (LIT). New degree pathways into LIT’s honours bachelor of science in civil engineering management, honours bachelor of business, bachelor of science in creative broadcast and film production, honours bachelor of art in design and honours bachelor of arts in community sport development add to the list of previous agreements, which include articulations for Canadore students into their bachelor of arts in culinary arts and bachelor of science in sports strength and conditioning. In order to be eligible for advanced standing into one of LIT’s bachelor programs, students must successfully complete Canadore’s culinary management, strength and sport conditioning, broadcast television, graphic design, recreation and leisure services, civil engineering technology, business or digital cinematography diploma programs. Canadore initiated a partnership with LIT in 2014, which framed areas of cooperation in the exchange of students and employees; academic materials; as well as the creation of collaborative programs leading to joint credentials and research activities and business incubation centre activities. Nearly 20 Canadore alumni have articulated directly into LIT degree programs, with 10 celebrating the completion of their bachelor degrees today at Canadore College in North Bay, Ont.